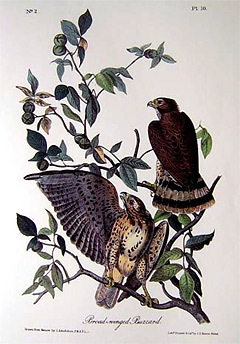 Pictured (right) is John J Audubon’s illustration of the Broad-winged Buzzard, today commonly referred to as the Broad-winged Hawk. This hand-colored lithograph is Plate #10 from the Octavo Edition of Birds of America – created from 1840 to 1844. BROAD-WINGED HAWK, Falco Pennsylvanicus, Wils. Amer. Orn., vol. vi. p. 92. FALCO PENNSYLVANICUS, Bonap. Syn., p. 29. BROAD-WINGED HAWK, Falco Pennsylvanicus, Nutt. Man., vol. i. p. 105. BROAD-WINGED HAWK, Falco Pennsylvanicus, Aud. Orn. Biog. vol. i. p. 461; vol. v. p. 377.